I studied graphic design at an art university in Japan. 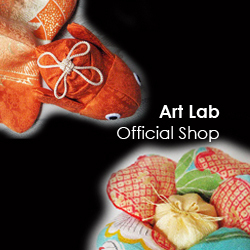 Many teachers recommended to review and research about Japanese traditional painting. For layout studying material, especially about Rinpa. As you see this painting method adopts strictly layout and colouring balance. The Ukiyo-e is also great material for study. 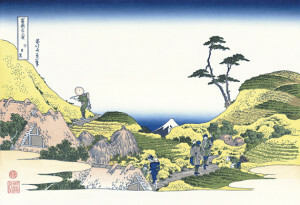 The “floating world” indicated in ukiyo-e signifies “reality,” and had its beginnings in paintings depicting the lives of common people in Kyoto in the latter 16th century. It wasn’t until the 18th century (the Edo period) when ukiyo-e spread to many people as a popular culture. 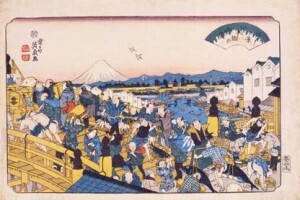 Factors which led to its popularization include the improvement in wood-block print techniques, the depicting of accessible subjects such as actors and beautiful women, and the flourishing during this era of literature intended for the masses. 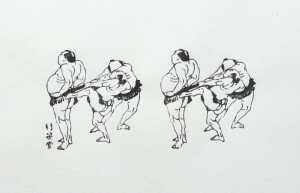 The artists who had been providing illustrations for such books subsequently became ukiyo-e painters. As ukiyo-e developed into the painting style for the common folk, the people’s entertainment became the subject for those paintings. Yakusha-e, which were likenesses of kabuki performers, were similar to publicity photographs of movie stars today. Bijin-ga were paintings of women in the Edo period, which can be compared to the ideal urban image of a beautiful woman by today’s male standards.